The Federal Building and U.S. Courthouse in Port Huron, Michigan, is located on the south side of the Black River in the central business district. It has the distinction of being the oldest federal building in the State of Michigan still occupied by the federal government; it was built to house some of the government’s oldest agencies. The building was designed by Alfred B. Mullett and constructed in 1877 to house a post office, a U.S. Customs office, and the U.S. Courts. It’s a three-story building that included gas chandeliers, 17 Vermont red marble fireplaces, ornate modified Corinthian capitals, and a cupola – characteristics of the Classical Revival Era. In its 132 years, the 44,397-square-foot courthouse has served a significant role in the international border crossing’s history and remains a significant landmark in downtown Port Huron, according to Steve Ernest, the property manager. Recent improvements to the building included an HVAC upgrade, boiler system replacement, energy management controls, installation of a fire alarm system, and a window tinting/re-glazing project. The Whitehouse Council on Environmental Quality Planning for Federal Sustainability in the Next Decade Executive Order 13693, according to Ernest, provides an emphasis on additional reduction in energy and water consumption, as well as the application of renewable energy for buildings. 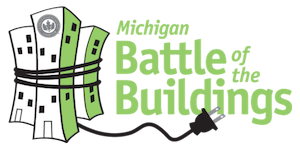 Building managers were inspired to participate in the Michigan Battle of the Buildings program after other GSA properties participated in the program last year, Ernest said. According to him, the GSA Great Lakes Region recognizes the value and credibility of the Battle of the Buildings program. In 2015, the facility reduced energy consumption by 29.53 percent, which Ernest attributed to upgrade projects to their systems, including the installation of a pressure equalizer line to their three building boilers. According to Ernest, competing in the “Public Buildings” category of the competition recognizes the time and effort the Federal Building/U.S. Courthouse has put forth. “We believe it validates the amount of time, resources, and manpower spent in the maintenance and operation of the building and demonstrates to our tenants how GSA is committed to operating efficient/green buildings no matter the size or number of tenants,” said Ernest.